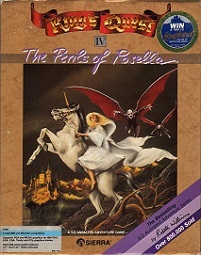 Following Alexander's escape from the evil wizard Manannan, return to Daventry and rescue of Rosella from the three-headed dragon in King's Quest III, king Graham is ready to pass on his adventure cap to one of his children. While the cap flings through the air, Graham is unexpectedly struck by heavy pain in his chest and falls to the ground. Death is near for Graham and, while the royal family watches over him, Rosella retreats to the throne room, weeping in despair. At that moment a fairy calls her though the magic mirror. Fairy Genesta offers Rosella the chance to heal her father. In the land of Tamir there is magic tree which bears just one fruit every hundred years, a fruit which heals all disease and provides its consumer with a long healthy life. However, the only way for Rosella to be able to return to Daventry is by also helping the fairy. Genesta has lost her life-giving talisman to the evil fairy Lolotte, who lives in the mountains of Tamir. 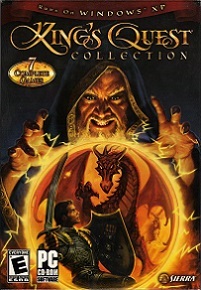 Rosella will have to infiltrate and gain Lolotte's trust to be able to recover Genesta's talisman, a task which will require the accomplishment of several dangerous assignments. Rosella will have to find a unicorn, a magic hen and Pandora's box and bring them to Lolotte. 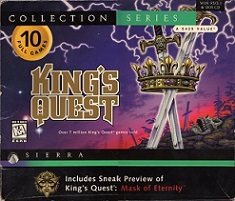 On her adventure she will confront ghosts, ogres, zombies, a mummy, witches and many more characters in this fourth installment of the King's Quest series. Time is of the essence. Rosella has just one day to help Genesta, find the fruit and return to Daventry to save her dieing father. 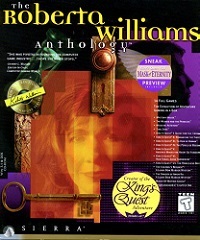 King's Quest IV, written and designed by Roberta Williams, was a technological leap forward for Sierra On-Line. It was the first game to introduce the SCI engine, offering far more graphical detail in addition to being the very first commercial game ever to support sound cards, such as the Roland MT-32. The SCI engine also allowed more flexible scripting and the use of a mouse. It was also simultaneously released with Sierra's older AGI engine. 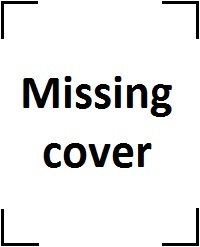 The AGI release, which was only shortly available, is considered a collector's item due to its rarity. 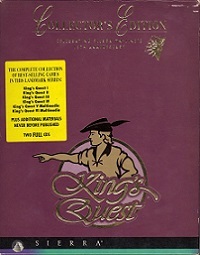 The game uses EGA graphics and has also been released for the Apple II computer, as well as being included in many collections.